Giant cell tumor (GCT) of bone is a locally aggressive destructive benign tumor usually involving the ends of long bones. The most common age group of presentation is 20–40 years with a female predominance and it accounts for approximately 20% of all benign bone tumors. Most common sites of presentation for the GCT in decreasing order are distal femur, proximal tibia, and distal radius. Traditionally, surgery is the mainstay of treatment in GCT. However, the disease can recur even with the optimal procedure. Understanding role of the receptor activator of nuclear factor kappa-B (RANK)/RANK-ligand (RANKL) pathway in the pathogenesis of the GCT has led to the development of the monoclonal antibody denosumab against RANKL. Here, we reported one such case of GCT of distal femur treated with preoperative 6 cycles of denosumab and followed by extended curettage, phenol cauterization, and cementing. A 20-year-old female presented with a history of pain and swelling over the right knee for 4-month duration. There was no history of trauma or fever. On the local examination, three was a firm, nontender, well-defined swelling arising from the lateral aspect of the right distal femur. There was no crepitus and tenderness, and the range of movement at the knee was normal. Frontal and lateral radiograph of the right knee showed a well-defined eccentric expansile meta-epiphyseal lytic lesion involving lateral condyle of the right distal femur measuring approximately 4 cm × 6 cm [Figure 1]a. There is cortical thinning with few foci of cortical breach on lateral and anterior aspect. The lesion has irregular margins with relatively broad zone of transition in superior aspect. There is no obvious extension into knee joint cavity. There is no matrix calcification or associated soft-tissue mass. Magnetic resonance imaging (MRI) revealed 4.5 cm × 4.3 cm × 5.9 cm multiloculated lytic mass on the distal right lateral femoral condyle with extension to the surrounding soft tissue but without involvement of the joint. Needle biopsy from the lesion showed the presence of several multinucleated osteoclast-like giant cells in the background of stromal cells confirming the diagnosis of GCT [Figure 1]b. Further investigations showed no distant metastasis. Considering clinical picture, imaging, and biopsy, the patient was treated with neoadjuvant subcutaneous injection of denosumab 120 mg subcutaneous every 28 days up to 6 cycles and with additional 120 mg on the 8th and 15th day of the first cycle of therapy. The patient was followed up every month. After completion of six doses of denosumab, X-ray and MRI of the lesion showed consolidation of the lesion with reduction of size, sclerosis, and healing of the cortical breaks [Figure 2]a. The patient treated with extensive curettage with a cortical window with high-speed burr, cauterization of the wall of the cavity with phenol, and filling the resulting cavity with 80 mg of polymethylmethacrylate bone cement [Figure 2]b. Sample was sent for histopathology study and revealed a significant decrease in the number of giant cells as well as stromal cells with areas of fibrosis indicating response to denosumab [Figure 3]. There was no evidence of wound infection in postoperative period. The patient was discharged after suture removal. The patient could comfortably bear weight on the 2nd postoperative day; she resumed her routine physical activity after discharge. RANKL is the ligand for endogenous protein osteoprotegerin expressing on the surface of osteoblasts and released into the microenvironment where it binds to and activates its receptor RANK on the immature osteoclast. The activation of RANK-RANKL is necessary for the formation, survival, and function of osteoclast, and hence, blocking interaction between RANK-RANKL will limit the osteoclastogenesis. In GCT, osteoclastic giant cells are uniformly distributed in a background consisting of mononuclear rounded cells and spindle-shaped stromal cells with high levels of RANKL expression. Aggressively lytic behavior is the hallmark of the GCT. This osteoclast-like tumor giant cell is responsible for this lytic process, and RANKL potentiates this osteoclast differentiation of monocytes leading to the process. Denosumab is a human monoclonal antibody that binds to RANKL with high affinity, preventing its interaction with RANK on the osteoclast surface and inhibits normal or tumor-associated osteolysis disrupting the cycle of bone destruction., The dose schedule of the denosumab also varies, and it may consist of three loading doses of 120 mg at 7 days apart followed by one dose every 4 weeks or consists of 120 mg monthly dose without any loading dose., Published data showed that denosumab suppresses bone destruction in patients with osteolytic bone disease such as bone metastases in breast and prostate cancer and other solid tumors. Denosumab has the ability to prevent tumor progression, induce primary tumor reduction, increase bone formation, and reduce pain in GCT. A phase II study showed the benefit of treatment with denosumab in altering the osteolytic effect of GCT of bone. 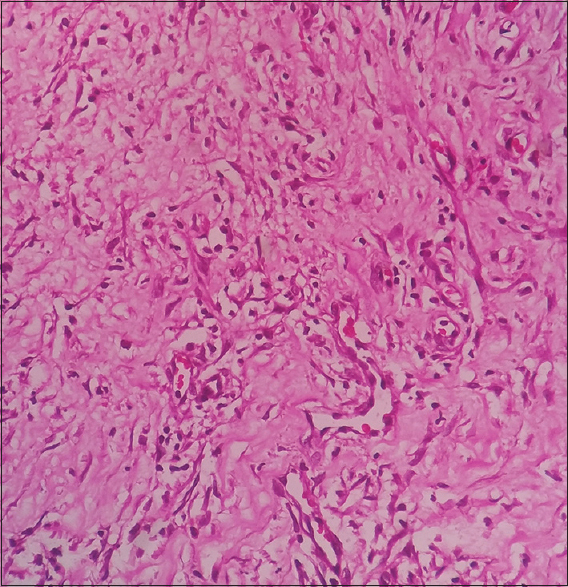 A study on histologic comparison of baseline and after treatment with denosumab for the GCT of bone showed a response in classical architecture, changing from proliferative densely cellular stromal cells, RANK-positive mononuclear cells, and tumor giant cells to nonproliferative osteoid matrix, wove bone, and new bone with only focal areas of proliferative RANKL-positive stromal cells and mononuclear cells and with greatly reduced number of tumor giant cells. It indicates the differentiation of tumor cell component toward a nonproliferative osteoblastic phenotype with a marked reduction in osteolysis. The possible mechanism of such response may be indirectly by eliminating factors associated with tumor giant cells or by direct action on the tumor stromal cells to form bone. Denosumab delayed disease progression, prolonged time to surgery, and downgraded the tumor that reduces the need for mutilating surgery in patients with GCTB. However, many questions are remain unsolved including the optimal timing for excision of tumor in a patient receiving neoadjuvant denosumab as well as the optimal duration of treatment in unresectable tumor and also the need for adjuvant therapy with denosumab to prevent relapse. Furthermore, the exact proportion of relapse patients receiving neoadjuvant denosumab is unclear. Prospective randomized trial studies with larger sample size are necessary to know the different stages of treatment, optimal dose, its side effect, and pattern of disease progression after discontinuation of the denosumab. Egbert RC, Folsom R, Bell J, Rajani R. Denosumab therapy for giant cell tumor of bone pulmonary metastasis. Case Rep Orthop 2017;2017:2302597. Singh AS, Chawla NS, Chawla SP. 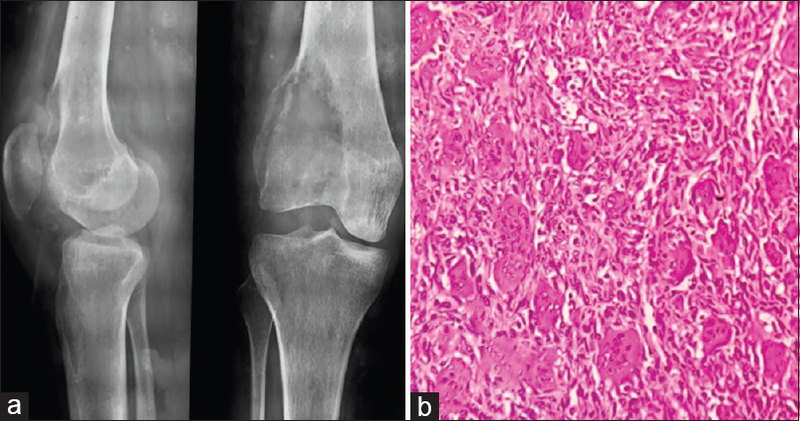 Giant-cell tumor of bone: Treatment options and role of denosumab. Biologics 2015;9:69-74. Branstetter DG, Nelson SD, Manivel JC, Blay JY, Chawla S, Thomas DM, et al. Denosumab induces tumor reduction and bone formation in patients with giant-cell tumor of bone. Clin Cancer Res 2012;18:4415-24. Josse R, Khan A, Ngui D, Shapiro M. Denosumab, a new pharmacotherapy option for postmenopausal osteoporosis. Curr Med Res Opin 2013;29:205-16. Chawla S, Henshaw R, Seeger L, Choy E, Blay JY, Ferrari S, et al. Safety and efficacy of denosumab for adults and skeletally mature adolescents with giant cell tumour of bone: Interim analysis of an open-label, parallel-group, phase 2 study. Lancet Oncol 2013;14:901-8. Demirsoy U, Karadogan M, Selek Ö, Anik Y, Aksu G, Müezzinoglu B, et al. Golden bullet-denosumab: Early rapid response of metastatic giant cell tumor of the bone. J Pediatr Hematol Oncol 2014;36:156-8. Martin-Broto J, Cleeland CS, Glare PA, Engellau J, Skubitz KM, Blum RH, et al. Effects of denosumab on pain and analgesic use in giant cell tumor of bone: Interim results from a phase II study. Acta Oncol 2014;53:1173-9.